Thanksgiving 2013 began with me trekking to downtown Austin to participate in the annual Turkey Trot 5-Mile Run with friends Ryan and Heather Bart, and Nick Manson. I did three 5Ks in 2012, but this would be my first 5-mile run. I pretty much winged it and didn’t bother spending much time getting into shape leading up to the event, unlike my friend Bart who spent two months running like a madman to get into shape! Gotta give Bart credit, he was one motivated guy and he went from hating the idea of running to doing 4 miles like nothing, truly an inspiration to us all. Anyway, I was among 23,000 participants who took off at 9:30am from the Congress Ave. bridge. Mile 1 was easy. I veered off for a cup of water from a volunteer and lost the group and never found them again, but I was wanting to go at my own pace anyway. A half mile later both ankles got extremely tight and sore to the point where I wondered if I’d actually be able to go on. I stopped and stretched them and continued onward. I got to a big downhill slope and changed form and ran on my toes, and the pain subsided. I didn’t see any more signs until Mile 3, and was stunned to see I was at 28 minutes at that point. That was a faster pace than my previous best 5K time. So I guess when I was running I was really moving. From that point on I felt pretty good. I stopped to walk a couple of times for maybe a minute at the longest, then went back to running. 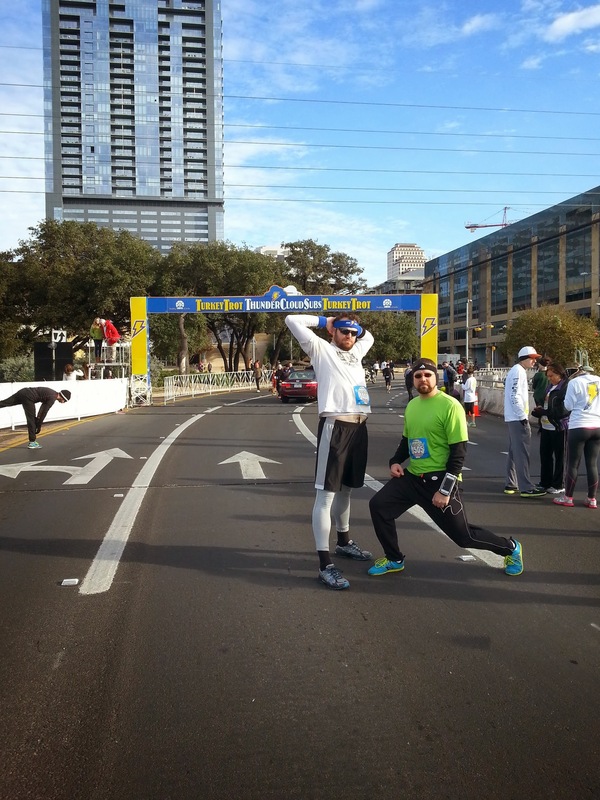 I crossed the finish line at 51:02. Bart finished in just under 46 minutes and Heather was next at around 49 minutes. Nick apparently finished around 51 minutes also. Five miles is a long damn ways to run. All the time, I kept telling myself to just pretend like I’m running from the Glanzer farm to the grain bins on Highway 28 just outside Carpenter. That ought to be about five miles and didn’t seem all that far. I don’t think it did anything mentally to help but it put things into a perspective I could better familiarize myself with. Of the 268 men aged 30-34 who chose to be timed, which was at best 20%, I finished 225th. The winner was a guy who ran it in 24 minutes!!! Who is this freak of nature?! Bart and I were among the first to line up for the race. 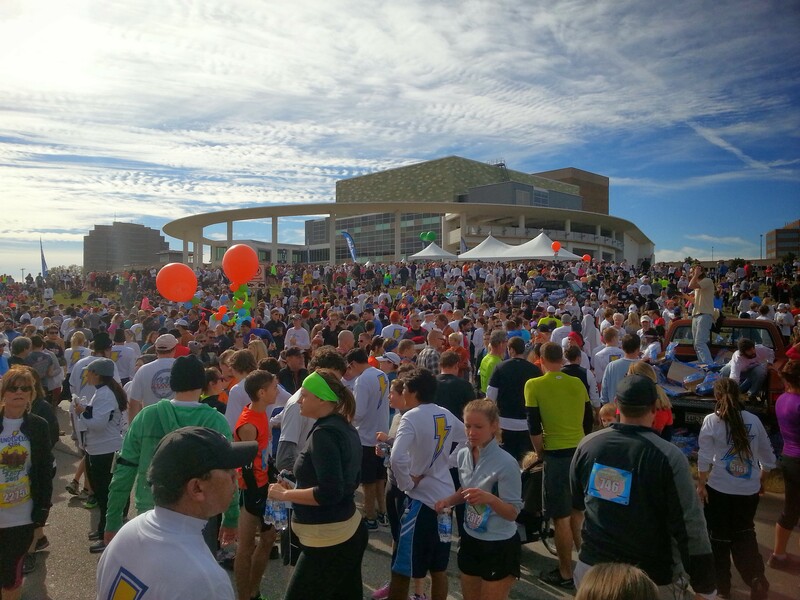 Participants gather before the start of the 2013 Austin Turkey Trot. I worked up a big appetite with the run, and later in the afternoon we ventured over to our friend Elizabeth Vivirito’s parents’ house in the Bee Caves area of Austin for dinner. Many thanks to the Miller family for having us vagabonds over for a delicious dinner! We also joined the Glanzer family via video chat at their celebration in Vermillion, South Dakota, and later the Poulter celebration in Bloomington, Minnesota. As my boss’s 9-year old son recently said, “technology today amazes me.” Lauren continued the fun by visiting other friends’ Thanksgiving dinner late in the evening while I passed out cold on the couch watching football. In other news, you probably saw that I finished building that farmhouse table. When Lauren first told me she wanted me to build us a new table, I scoffed at the idea and said it couldn’t be done. But I managed to do it… not without a few hiccups along the way, mind you, but we have a good looking sturdy table that can easily seat 8 adults. We’ve got the lumber to build two matching benches at some point in the future. Of the things I’ve built out of wood, this would have to out-rank the TV Guide shelf, the dog crate, and the yarn spinning thingy. 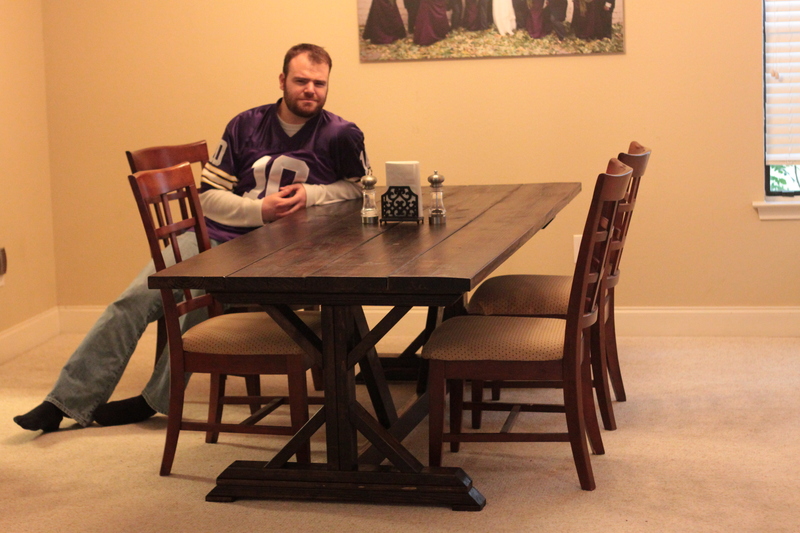 Me at my finished farmhouse table. A+ for effort! We’ll see how she holds up in the long run. 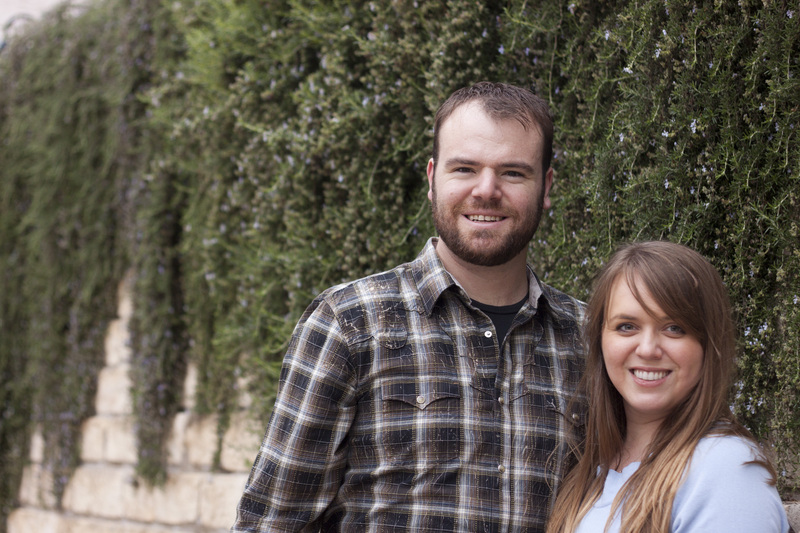 Lauren and I went out last weekend to a local winery with friends Brian and Kristin Mego to take each other’s pictures for Christmas cards. The temps were in the 30’s all last week which to us felt like heaven after the hellish heat this past summer. You’ll have to wait for your card to show up in the mail to see the winning shot, but here’s another photo to satisfy in the mean time. It also doubles as a sixth anniversary photo, as November 30 marks the anniversary of my and Lauren’s first date at Chapati Indian Restaurant in Edina, MN. Lauren and I six years after our first date. Who’d have ever thought this wild stallion could be tamed. Also this weekend I’ll be back at the office as we prepare a major launch at Callaway. I’ve spent the past three months preparing dozens of new e-mail campaigns and I’ve got to be sure they’re good to launch to the masses on Sunday afternoon. The big news with CG is the relaunch of Big Bertha, one of the most famous golf clubs known to man. I’ve held the new driver and fairway wood and I can honestly say this is a fantastic product that will revolutionize the game. Next Winter Strikes, Christmas Party, Granny on the Phone?